"H'el on Earth": "Into Kandor"
After Superman had put his Kryptonian armor on the clone Superboy to save his life, both of them were removed from the Man of Steel's Fortress by the being known as H'el. Meanwhile, Kara Zor-El thinks back to a time on Krypton when she drove her friend Tali's aircar in the time before she must move with her family to Kandor. Now, H'el has recruited Supergirl in his quest to save Krypton from destruction. In order to go back in time to do so, he and the Maid of Might need a Quantum Crystal from Kandor's Central Power Station. H'el himself cannot enter the bottled city Kal-El rescued from Brainiac, but his powers can transport Kara there. Once he accomplishes this, the next phase of his plan can move forward. Supergirl now finds herself inside the protective dome containing the miniaturized Kandor. There, she is greeted by an astral projection of H'el, whose face is no longer scarred. The pair finds everyone in the city, including Tali, in stasis guarded by the robotic Terminauts. The gigantic automaton attack the Lost Daughter of Krypton. She makes short work of them in spite of their being able to hurt her a bit. Saving Tali gives her the strength to fight on. 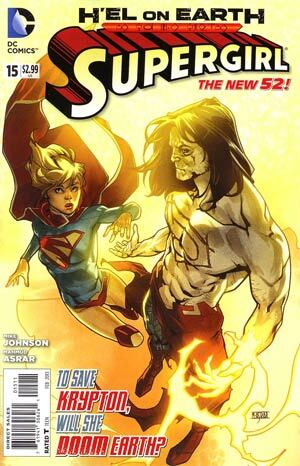 Supergirl and Astral H'el then continue to head for Kandor's Central Power Station. Will they find what H'el needs, or will the mysterious being need to find another means of making his plots come to fruition? Having retrieved the Quantum Crystal from Kandor, Kara Zor-El has returned to H'el in Superman's Fortress. Sensing in him a bit of a kindred spirit, Supergirl sees a side of the unknown being he has rarely shown. H'el and Supergirl embrace leading to a powerfully passionate kiss. Together, they may be a force to reckoned with, and even the combined powers of Superboy and Superman may not be enough to stop them. To Be Continued in Superman #15. Story - 5: This is another exciting issue that puts a lot of interesting questions in readers' heads. What are H'el's true intentions? Does he really want to save Krypton, and if so, for what purpose? Will Superman and Superboy be able to stop H'el now that Kara seems to be on his side? Like any good cliffhanger in an old radio show or movie serial, these kinds of things make you want to see what happens in the next chapters. I can't thank the writers of the Superbooks enough for that. Like previous issues, this one, has some of the best character moments in recent comics. Scenes with H'el and Kara in Superman's Fortress particularly pack an emotional wallop. I can't stress enough how much I love these kinds of things in Mike Johnson's hands. Let's hope he continues to show this strength throughout his run on Supergirl. All and all, "H'el on Earth" has given even the most lackluster of the Supertitles the boost they need. Supergirl has been the strongest one of the bunch in recent months before this story started, and it continues to be a great comic so far. Yet, Superboy and Superman have had their ups and downs. Thanks to this crossover, my interest in the New 52 Superman family has been renewed. Art - 4: While it's improved somewhat compared to the previous issue, Mahmud Asrar's renditions of Superman still look odd. Superboy, Supergirl and the rest of the images are amazing. Yet, the Man of steel seems too strangely drawn for my taste. Asrar may be trying to make him seem more alien, but it just does not work for me. Aside from that, every page is stunning in the visual sense. Cover Art - 5: This is yet another cover that really got me curious about what would go on in the comic book. It has that old school feeling mixed with the new style. If this doesn't make you buy this issue of Supergirl, nothing will.